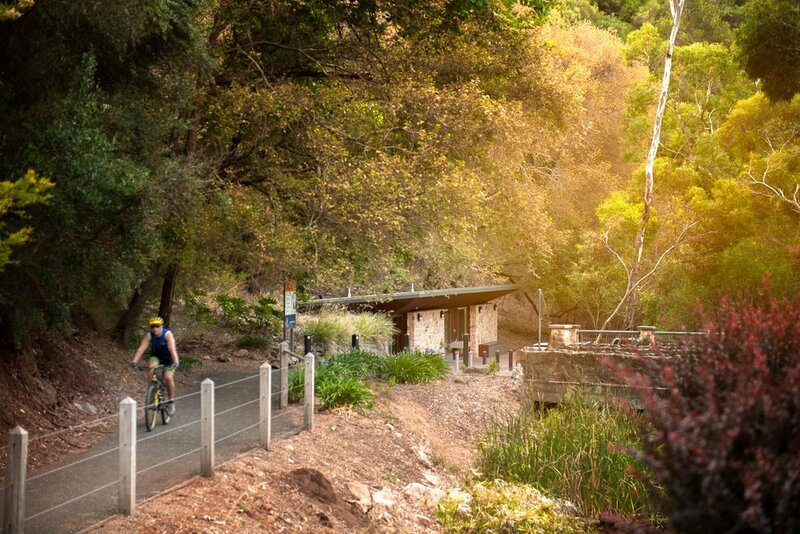 The project site is within Cleland Conservation Park Waterfall Gully Precinct, located in the foothills of the Mt Lofty Ranges, a popular walking and visitor destination. Every year, up to 400,000 people are visiting Waterfall Gully. Flightpath was engaged to design, document and administrate the contract for a new toilet block and shelter structure to replace existing outdated and non-compliant facilities. The project scope also included a carpark and infrastructure upgrade. The design approach of the building responds to the materials and forms of the Kiosk and older outbuildings, and the setting within the confines of Waterfall Gully. The new structure is constructed with reclaimed stone and clad with timber battens and corrugated iron, and of a form appropriate to the heritage context and curtilage of the Waterfall Gully Kiosk, a State Heritage Place. The project has improved the user experience for the visitors, as well as the experience of park rangers, who look after this public facility. The fixtures were carefully selected and designed into the project to minimise maintenance requirements and possible damages by vandalism. The plumbing for toilets and basins are located in lockable enclosures. Toilets are also plumbed to the rainwater tanks (approximately 7000L between 4 tanks). Response from both the end-user representatives (Department of Environment, Water and Natural Resources) and public has been very positive since the facility’s open in November 2015. The new toilet block structure aims to provide a well-designed public facility which is sympathetic and complementary to its surrounding by nestling well into the site, and at the same time, has its own contemporary character and presence. It received an AIA Small Projects Commendation in 2016.